We’re now in the fourth quarter, which means that holiday shopping estimates are front and center. Not only can holiday shopping tell us what the most popular stores are, it’s also a great way to gauge the economy. If people are spending more, it’s a sign that things are going well. After all, two-thirds of our gross domestic product (GDP) is from consumer spending. And of course, the main focus this year will once again be online shopping. Over the past few years, we’ve seen a huge divide in retail stocks. Some have thrived, while others have been among the worst performers in the market. Basically, if you’re a company that doesn’t adapt to e-commerce, investors want no part of you. And there’s a very good reason for this: It’s one of the fastest-growing parts of the market. 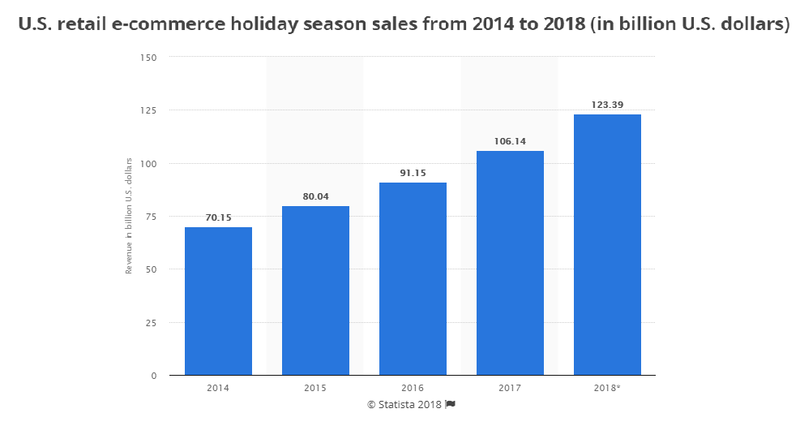 This year, online sales during the fourth quarter should to go up by over 16%, or $17.25 billion. That’s a ton of growth! As a reference point, sales from companies in the S&P 500 Index should go up 6% in the fourth quarter this year. And even 6% is high. The average growth since the beginning of 2013 is about 2.42%. If online sales meet expectations this year, they will have grown by 76% since 2014. That’s about 12.7 times as much as sales from S&P 500 companies. So, clearly, this is a great part of the market to invest in during this time of year. Right now, we’re seeing record levels of spending and consumer sentiment. Online shopping will once again have amazing growth this year. And recently, a new exchange-traded fund (ETF) came out for online retailers. It lets you invest in 22 different companies for the price of a single stock. It’s called the ProShares Online Retail ETF (NYSE: ONLN). This ETF is going to be a great investment over the next several months.